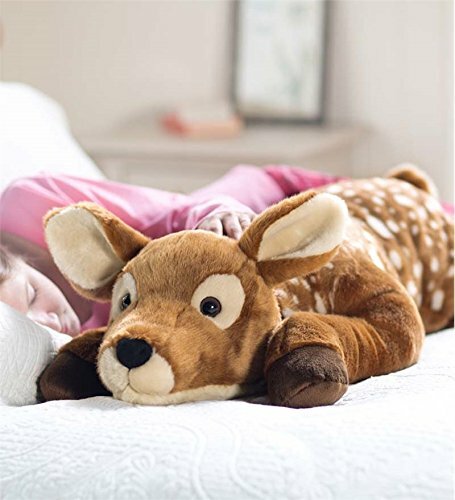 Plow & Hearth exclusive - our friendly fawn body pillow is crafted with super-soft, super-dense "fur" fibers. Beaded eyes and a perky nose gives him lots of personality. Sacks of beans sewn into the midsection and Paws add weight and girth. Polyacrylic. Spot clean.Attention: this is an exclusive Plow & Hearth product that is only available from us. Please be sure to choose Plow & Hearth as the seller to guarantee you are receiving a product that has been properly constructed and tested and that is supported by our U.S.-Based Plow & Hearth customer service. No other sellers are authorized to offer this unique product on Amazon, and plow & hearth-provided warranties will be invalid for purchases through unauthorized sellers.